Based in South Florida Alfredo Valentine, a master wedding photographer leads a team of the most professional photographers photographing weddings throughout south Florida. Founded in Fort Lauderdale in 2008, Couture Bridal Photography has become the premiere south Florida wedding photography studio. Best known for the most unique and distinct artistic wedding photography style, Couture Bridal Photography has been independently rated among the top 3 wedding photographers in Fort Lauderdale. Couture Bridal Photography has also been independently rated among the top 20 wedding photography studios in South Florida. Brides and grooms choose Couture Bridal Photography for their artistic photojournalistic style with a blend of editorial, glamour and fashion photography influence. This proprietary style of wedding photography is elegant, romantic and timeless. As a result of our success, Couture Bridal Photography has grown to have offices in various locations throughout South Florida and across the United States and Puerto Rico. 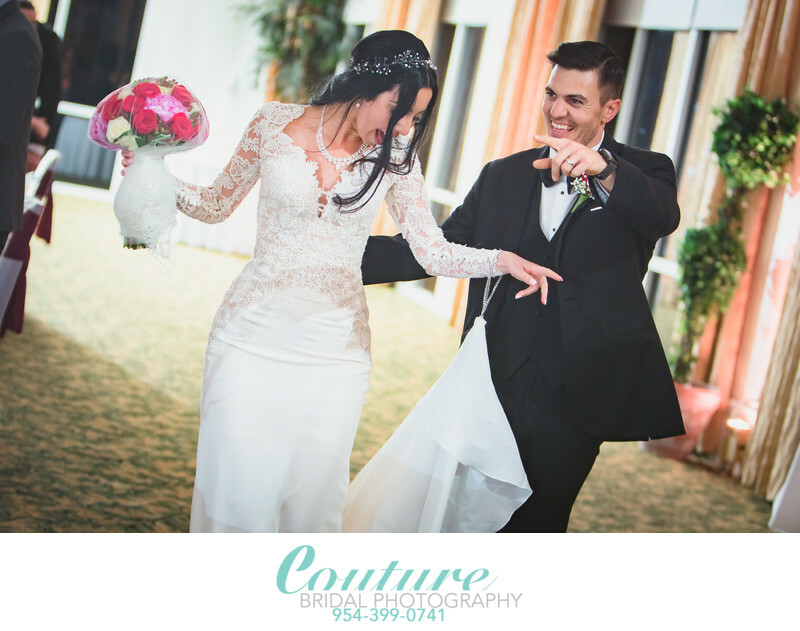 Couture Bridal Photography is the largest and most successful wedding photography studio offering the best value, services and photography for couples getting married throughout south Florida. Couples getting married in south Florida can book Couture Bridal Photography to photograph their weddings from Key West to Port St. Lucie, including Naples, on the west coast of Florida. The Florida Keys which is a chain of small islands that extend from Key Largo to Key West is the southernmost part of south Florida. Monroe County, is the county to which the the Florida Keys belong. The Florida Keys hosts weddings for south Florida couples, as well as destination weddings of couples from around the United States and around the world. The Florida Keys offers a variety of wedding options for couples looking to get married in a tropical paradise without leaving the United States. The Florida Keys offer a variety of venues from beachfront budget weddings to ultra luxurious resort weddings. The Florida Keys are also very popular for small elopements along the shore with just an officiant and a few of the couples closest friends and family. Couples getting married in the Florida Keys can hire Couture Bridal Photography for the best wedding photography in the Florida Keys. Couture Bridal Photography has an office in Tavanier at 136 Tavern Drive. Tavernier, FL 33070 to meet easily with couples planning their wedding in the Florida Keys. Miami which lies within Dade county Florida which extends from Homestead to Aventure and North Miami is popular with couples planning all kinds of weddings. Dude county offers rustic farm weddings to ultra luxury weddings that take place at resorts along Miami Beach. Another popular location for weddings in Dade county is Coral Gables. Coral Gables offers ultra luxury wedding venues such as the Biltmore Hotel and Hotel Colonnade. Couture Bridal Photography offers the best wedding photography and bargains on high-end wedding photography throughout Miami, Miami Beach, Key Biscayne and Sunny Isles Florida. We provide couples with the best photography on their wedding day anywhere in Dade county, Florida. Naples Florida is located on the southwest coast of Florida in Collier county. Naples is known for being the wealthiest cities in the United States per capita as of 2012. Known for its high end shopping, golf courses and beachfront resorts, Naples Florida is one of our favorite locations to photograph weddings. Naples Florida is famous for beautiful sunsets, its fishing pier that was built in 1888 and many luxury resort hotels including the Ritz Carlton Naples that host luxurious weddings yearly. Marco Island is a city just off the coast of Naples, Florida is a barrier island in the Gulf of Mexico. Bridges from Naples allow visitors to enjoy Marco Islands beautiful beaches and landscape. Couples from around the world get married along the beach in Marco Island, especially sunset wedding ceremonies. The JW Marriott Marco Island is one of our favorite wedding venues to photograph weddings. Southwest Florida is one of our favorite locations in Florida to photograph weddings for brides and grooms looking for the most amazing wedding photos to remember the most important day in their lives. Broward county is home to a number of cities and towns most popular for weddings in South Florida. We also have the largest presence in Broward county with a number of offices and locations where couples can meet with us to book the best wedding photography in Fort Lauderdale. Fort Lauderdale is popular for weddings and travel with Fort Lauderdale international airport and Port Everglades with cruise ships leaving daily for Caribbean destinations. Easy access to the Caribbean and around the world for honeymoons after a wedding makes Ft. Lauderdale, one of the most preferred cities for weddings in the United States. Fort Lauderdale Beach is by far one of the most popular locations for weddings in Fort Lauderdale. Fort Lauderdale with 7 miles of beachfront and an amazing assortment of resorts and hotels is host to thousands of weddings every year. Couture Bridal Photography photographs over a 100 weddings a year along Fort Lauderdale Beach, making us the most experienced and preferred wedding photography studios in Broward County Florida. The Pier 66 Hotel and Marina located at the southern end of Fort Lauderdale Beach is one of the resorts that hosts weddings where Couture Bridal Photography is called upon to provide wedding photography coverage. Among the top choices for couples hosting a wedding, the Pier 66 Resort and Marina has a slow turning ballroom that provides a rotating view of the ocean and downtown Fort Lauderdale, Florida. This is a unique and luxurious wedding venue to host a wedding with many spots for spectacular wedding portraits. The Fort Lauderdale Marriott Harbor Beach Resort and Spa is at the top of the Couture Bridal Photography list of favorite wedding venues! As one of the most preferred wedding photographers, we are super knowledgeable of the property and best places for taking the best photos. Couples getting married at the Fort Lauderdale Marriott Harbor beach book us over any other Fort Lauderdale wedding photographers. The Mahia Mar Fort Lauderdale Beach is a fantastic Fort Lauderdale venue Couture Bridal Photography frequently photographs weddings at. Among one of the top wedding venues in Fort Lauderdale, it has large ballrooms and amenities to make any wedding spectacular. The Bahia Mar Fort Lauderdale Beach hosts a variety of weddings, especially South Asian weddings. The Ritz Carlton Fort Lauderdale is Couture Bridal Photography's absolute favorite wedding venues for our style of wedding photography. The Ritz Carlton Fort Lauderdale has become a second home with the countless weddings we photograph there each year. Couples planning luxury weddings at the Ritz Carlton find our distinct wedding photography style is a perfect match for the ambiance and decor found in and around the Ritz Carlton property. Together with Panache Style, South Florida's top Floral designer and Event Decorator, brides are amazed time and time again with their photos. The W Fort Lauderdale is a luxury wedding venue Couture Bridal Photography frequently is requested to photograph weddings. The W Fort Lauderdale is a trendy luxury wedding venue popular with younger brides and grooms seeking an opulent luxury wedding venue with amazing amenities. The Conrad Fort Lauderdale Beach is the newest hotel resort along Fort Lauderdale Beach. The Conrad has become the new luxury wedding venue where we have begun to photograph weddings at for couples seeking a more opulent luxury wedding venue with a unique character and decor. Its grand ballroom is perfect for large wedding receptions. Couples also have the option of having a roof top outdoor wedding reception overlooking the atlantic ocean. Couture Bridal Photography is the most preferred Wedding Photography studio at the Pelican Grand Beach Resort. We photograph a lot of weddings here for couples looking for the ultimate wedding venue located right on the beach. The Pelican Grand Beach Resort offers a trendy high end beach resort backdrop for any style of wedding. Couples love the amenities and it ranks high among younger couples planning a wedding. Couture Bridal Photography has locations for meeting with brides and grooms planning wedding on Fort Lauderdale Beach. Located right on A1A, we are the most sought after Fort Lauderdale wedding photography studio. We also have offices at 601 North Rio Vista Blvd. Fort Lauderdale, FL 33301 to meet wedding photography clients near downtown Ft. Lauderdale. Deerfield Beach is Broward counties northern most city that hosts weddings. Couture Bridal Photography's Deerfield Beach office at 2400 Deer Creek Country Club Blvd. Deerfield Beach, FL 33442 is a convenient location to meet with couples getting married in Deerfield Beach. It also provides a convenient location for couples who are searching for a wedding photographer in Lighthouse Point and Pompano Beach. Couture Bridal Photography is the #1 wedding photography studio in Deerfield Beach. We are also the most preferred at Deerfield Beach Florida's wedding venues. The Deerfield Creek Golf club is located steps away from our Couture Bridal Photography Deerfield Beach office. This newly renovated golf course wedding venue is one of the most popular wedding venues in Deerfield Beach. The Deer Creek golf club offers a beautiful setting for indoor and outdoor wedding ceremonies and receptions. The Wyndham Deerfield Beach resort is just steps away from one of the most beautiful beaches in Broward county. The Wyndham Deerfield Beach Resort is Couture Bridal Photography's favorite wedding venue in Deerfield Beach for stunning wedding photo opportunities. Our photographic style of wedding photography works well with the Deerfield Beach pier and the rock shore line a short walking distance from the resort. The Royal Fiesta Event Center located in the Cove Shopping center is a popular wedding venue for couples on a budget. Couture Bridal Photography frequently photographs weddings at Royal Fiesta for couples on a budget that appreciate and want only the best wedding photography in Deerfield Beach. Royal Fiesta can be a challenging wedding venue for bridal portraits, but just over the bridge the beach front offers great opportunities for bridal portraits. The Lighthouse Point Yacht Club is one of our favorite locations to capture a couples wedding day. The Lighthouse Point Yacht club isn't located in Deerfield Beach, but close enough to mentions since it is located in an adjoining small city. Couture Bridal Photography has photographed many weddings at the Lighthouse Point Yacht club and we love shooting there. The property has a spectacular ballroom and dockside wedding photo opportunities abound. Palm Beach is the largest county in Florida. It is also the largest county east of the Mississippi river. Among Palm Beach County's claim to fame is being the home of President Donald Trump. Many of the worlds wealthiest people live along Palm Beach county's coastline. From Boca Raton north to Jupiter, Couture Bridal Photography is among the top wedding photography studios serving couples getting married in Palm Beach County. Most notable, Palm Beach county's most famous town Palm Beach is where the most spectacular ultra luxury weddings take place. Known for it's wealthy population and mansions overlooking the ocean, the town of Palm Beach is famous for celebrity weddings. Boca Raton Florida located at the south end of Palm Beach County is popular for elegant resort and luxury golf course weddings. Boca Raton has a beautiful beachfront along the Atlantic ocean. Boca Raton is known for high end shopping, fine restaurants and beautiful architecture. Couture Bridal Photography is also among the top South Florida wedding photographers serving the Boca Raton area. Couture Bridal Photography has a convenient location in downtown Boca Raton on Palmetto Park Rd. just a few blocks away from the Addison and Boca Raton Resort and Club. The Boca Beach club is a high end luxury oceanfront wedding venue, Couture Bridal Photography is proud to photograph weddings at routinely. The Boca Beach club offers the finest amenities, menu items and decor to make any bride and grooms wedding over the top luxurious. The service and facilities make the Boca Beach club one of the most sought after wedding venues for couples with the finances to afford it. Couples can get married along the beach or next to the properties 2 pools overlooking the Atlantic ocean. Receptions for several hundred guest indoors or outdoors are options a couple planning a wedding at the Boca Resort can choose. The Boca Raton Resort and Club, located right across the bay from the Boca Beach Resort is Boca Raton's ultra luxury wedding venue. Its Mediterranean architecture, high end restaurants, and gorgeous event space make the Boca Raton Resort and Club, a premiere Boca Raton wedding venue. Couture Bridal Photography, is among the most sought after wedding photography studios couples choose for their weddings at the Boca Raton Resort and Club. Brides and Grooms getting married at the Boca Raton Resort and Club can choose outdoor or indoor ceremonies, as well as receptions. Designed by famed architect, Addison Mizner in 1926, the Addison is recognized as one of the most important pieces of architecture in Florida. Initially created as the focal point of real estate operations for the Mizner Development Corporation, Mizner designed the Addison to serve as a visual example for his prospective clients and to house his sales offices, drafting rooms, a small apartment for himself, along with a restaurant. Modeled after Spanish painter El Greco’s home in Toledo, Spain, the Addison was known to have been one of his favorite buildings. Today, the Addison building is on the National Register of Historic places, and has been fully restored as South Florida’s premier wedding and event venue. Couture Bridal Photography is part of the Addison's history, as one of the many wedding photography studios in Boca Raton that frequently photographs weddings there. Delray Beach borders the north end of Boca Raton along the east coast of Palm Beach County, Fl. Delray Beach is best known for its trendy downtown night life and 2 amazing wedding venues. Couture Bridal Photography has an office located at 248 NE 1st Avenue, Delray Beach, FL 33444 to meet with brides and grooms planning to get married in Delray Beach, Boca Raton, Boynton Beach or Lantana. The Sundy house is a historical property, with an amazing restaurant, gardens and accommodations. The Sundy house is the preferred choice for couples seeking an elegant, yet chic garden wedding. The photo opportunities at the Sundy house are limitless. The Delray Marriott Mediterranean-style resort with a bar and a seafood restaurant, plus a fitness center & a spa located right across the street from the Beach. Couples get married at the Delray Beach Marriott with it large ballrooms, beautiful amenities and proximity to the beach. The other draw to choosing the Delray Beach Marriott for weddings is the Atlantic Avenue night life, fine restaurants and bars. West Palm Beach is a metropolitan area with several cities and towns that lie within Palm Beach County. Downtown West Palm Beach is best known for fine dinning, a busy nightlife and shopping. Downtown West Palm Beach is also the location of several high end wedding venues, Couture Bridal Photography routinely photographs weddings at for brides and grooms around the world. Couture Bridal Photography also has a presence in West Palm Beach to meet brides and grooms searching for the best wedding photography in West Palm Beach. The Harriet Himmel theater is a historic building located in the center of West Palm Beaches thriving nightlife. Couture Bridal Photography is a preferred wedding photography vendor at the Harriet Himmel Theater and has been providing couples with the best wedding photography in Palm Beach County since 2008. Couture Bridal Photography provides wedding photography for amazing brides and grooms at the Hilton West Palm Beach. The Hilton West Palm Beach is the newest West Palm Beach wedding venue with the service, amenities and event space for any luxury wedding. The Lake Pavilion located at 101 South Flagler Drive in downtown West Palm Beach is part of the City Commons and Waterfront Promenade area. The Lake Pavilion is a indoor venue with a beautiful terrace surrounding the facility. With floor to ceiling windows offering million dollar views of the Intracoastal Waterway, the Lake Pavilion is a picturesque, affordable setting for a wedding. The West Palm Beach Lake Pavilion established in 2010, hosts 175 seated or a cocktail reception for 275 with no vendor restrictions. Couture Bridal Photography takes advantage of the breathtaking ceremony locations that are just steps away, at the sea-scaled docks, lavishly landscaped lawns and intimate trellises of the West Palm Beach Lake Pavilion. The Town of Palm Beach is home to mansions that overlook the beach front, ultra high end shopping, ultra luxury hotels and resorts, as well as the home to Jon Bon Jovi and President Donald Trump. The Town of Palm Beach is a barrier island city that is known as Florida's playground for the rich and famous. Couture Bridal Photography frequently photographs engagement sessions along Worth Avenue, as well as high end weddings for some of the worlds most famous and wealthiest couples. The Breakers Palm Beach is Couture Bridal Photography's absolute favorite wedding venue to work in. The Breakers offers higher degree of European influence and architectural flair. Flagler’s newest iteration was modeled after the magnificent Villa Medici in Rome, an ambitious effort that called for 75 artisans brought in from Italy. Together they completed the intricate paintings, detailed across the ceilings of the 200-foot-long main lobby and first-floor public rooms, which remain on display today. It was a grand gesture that placed The Breakers in a class all its own. The Four Season Resort Palm Beach is an opulent oceanfront luxury hotel and wedding venue. Couture Bridal Photography is among the most trusted photography studios chosen to photograph weddings by couples getting married at the Four Seasons. The Four Seasons offers a variety of ceremony and reception options with 4 function rooms versatile enough for any wedding or amount of guests. The oceanfront offers amazing photo opportunities, as well as the Four Seasons common areas. Jupiter Florida is the Palm Beach County's most northern city. Located along the east coast, Jupiter is a unique city with golf courses, oceanfront parks and shopping. Couture Bridal Photography routinely photographs weddings in Jupiter Florida and Palm Beach Gardens. Jupiter is also home to some very famous athletes, who are residents of Jupiter Island. Tiger Woods and Celine Dion are among Jupiter Islands most notable residents. The Jupiter Beach Resort is Couture Bridal Photography's favorite wedding venue in Northern Palm Beach County. The Jupiter Beach resort offers beautiful oceanfront ceremonies and opulent reception space. The Jupiter Beach resort is among one of the best wedding venues in Palm Beach. Couture Bridal Photography offers the best bargain on wedding photography throughout South Florida. No other South Florida wedding photography studio has the experience, style and knowledge to create the most epic wedding portraits couples getting married will cherish for a lifetime. Couture Bridal Photography is the best South Florida wedding photography studio serving the Florida Keys, Miami, Naples, Fort Lauderdale and Palm Beach couples and visitors. 1/160; f/2.8; ISO 1250; 70.0 mm.